Has the person who initially signed up for ZoomShift left your organization? Do you want to give someone else control over billing? You can do this by transferring ownership of your ZoomShift account. 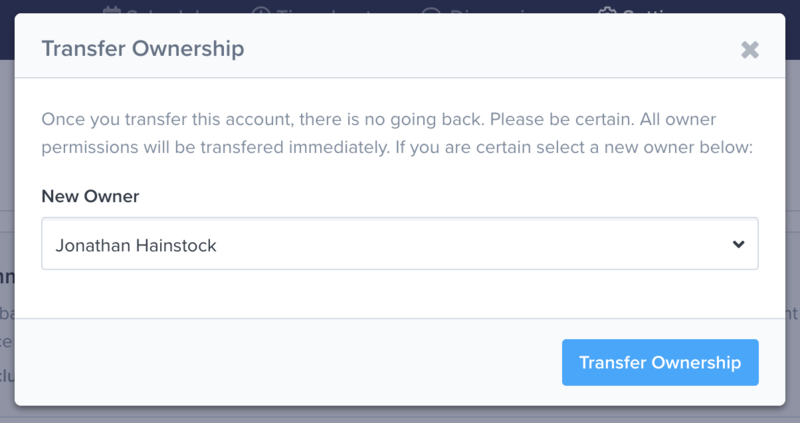 Note: In order to transfer ownership, you will need to login as the owner of the account. This is the person that first signed up for ZoomShift and has access to billing information. If you are not able to login to this account, contact support and we will help you out. Once logged in, go to the Settings => Account & Billing => Subscription Summary page. Next, click the Transfer Ownership button, and you will see a pop-up like the one below. Select another user in the account from the drop-down and then click the Transfer Ownership button.